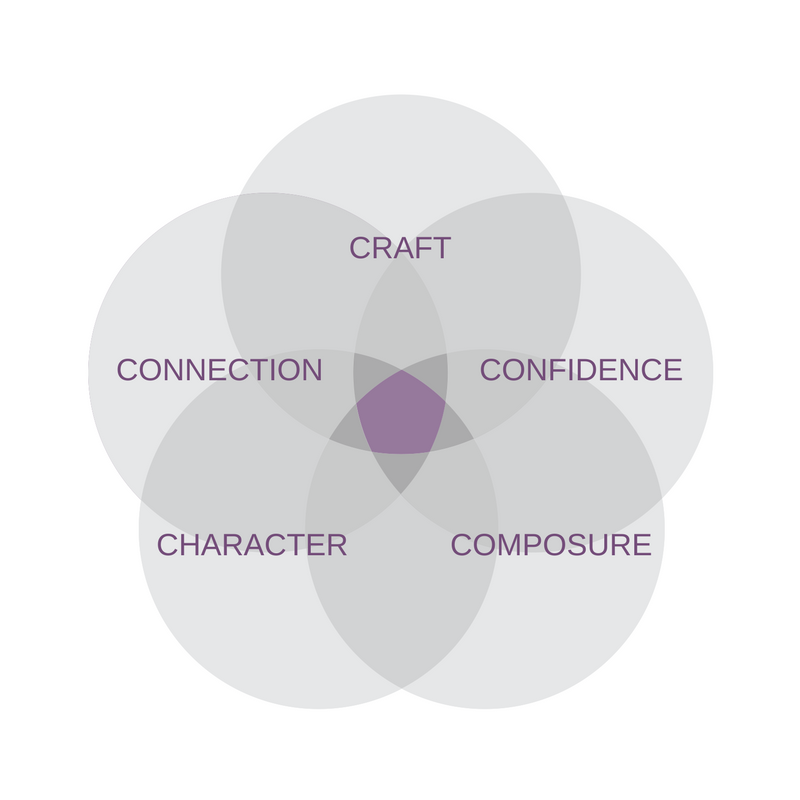 The 5 Cs model of Executive Presence encompasses the fundamental competencies of effective executive presence: Confidence, Craft, Composure, Character, and Connection. This involves building confidence, communicating a clear and concise message with intention, understanding and leveraging your professional brand and knowing your audience. Many leaders believe that executive presence is a set of intangible qualities that are untrainable- the 'it' factor. The 5 C's model adequately outlines qualities that are not only tangible, they are attainable. Over time, as an executive coach, I have designed this model and developed exercises and modules to train leaders at every level to access their authentic leadership presence and grasp skills needed to captivate and make an unforgettable impact. Each competency or 'C' stands on its own and each covers a very specific element of overall Executive Presence. Theory and exercises are presented to clients as a way to foster the skillset for each building block. Through this model, there is no stone unturned. In modules Craft and Composure, clients will master formal presentation skills, story telling, creating compelling written and visual content and then through Character, leaders unleash and tap into the set of values that drive their professional pursuit and passion so that communication with clients and peers is connected and captivating. Finally, in connection clients gain insight into their own personality styles and learn to understand the styles of others in order to establish meaningful working relationships and leverage skills like influence and pursuasion. Leaders embrace this work for its creative creative and thorough approach and note significant growth in their leadership impact whether focusing on one or all five components of the "5 C model of Executive Presence."